I have been waiting for this event for a very long time! I am SO excited to share with you that Walker Stalker Con is coming to NASHVILLE! That is right, zombie lovers! 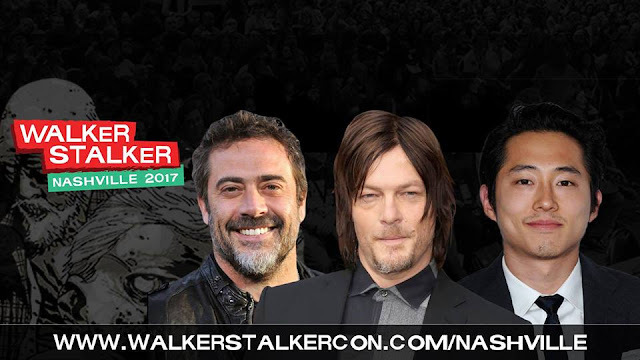 Walker Stalker Con Nashville will be held at The Music City Center, June 3-4, 2017! HAPPY BIRTHDAY TO ME, because my Birthday is the 3rd. More than 20 of the most popular actors from shows such as The Walking Dead, Sons of Anarchy, and more will speak to the audience, meet fans, pose for photos and sign autographs! The full list of guests are on the website! (subject to change of course). (All guests, excluding Melissa McBride who can only join us Sunday, are appearing on both Saturday & Sunday! Free panel sessions led by stars from some of television’s most popular shows. Zombies and cosplayers roam the convention floor, making for interactive experiences attendees will never forget. Reality TV star and celebrity tattoo artist, Chris 51 (A&E’s Epic Ink), will be offering his acclaimed artistic talents to attendees on the con floor. Vendors who deal in the comic, entertainment, zombie and other genres and industries. Did you know you can also apply to be an ambassador this event?! 18 or older! Apply HERE. I am excited to see the cosplayers! Melissa McBride (“Carol”), Jeffrey Dean Morgan (“Negan”), Norman Reedus (“Daryl”), Steven Yeun (“Glenn”), Jon Bernthal (“Shane”), Sarah Wayne Callies (“Lori”), Chandler Riggs (“Carl”), Lennie James (“Morgan”), Tom Payne (“Jesus”), Khary Payton (“Ezekiel”), Michael Cudlitz (“Abraham”), Josh McDermitt (“Eugene”), Christian Serratos (“Rosita”), Ross Marquand (“Aaron”), Scott Wilson (“Hershel”), Alanna Masterson (“Tara”), IronE Singleton (“T­Dog”) and more! What are you waiting for? Score your tickets before they get sold out today! Book photo ops HERE. Hurry because these are selling out FAST! Tickets range from $45 General Admission to $1,400 for the ultimate experience. Follow my Instagram because I will be sharing live from the event!! Be sure to follow Walker Stalker Con on their social channels below to stay up to date with the latest!